Honda Grazia Review – Price List, Mileage, Specifications, Features, Images and more! Read Honda Grazia Scooter Review. Check details like price list, mileage, specs, features, dimensions etc. 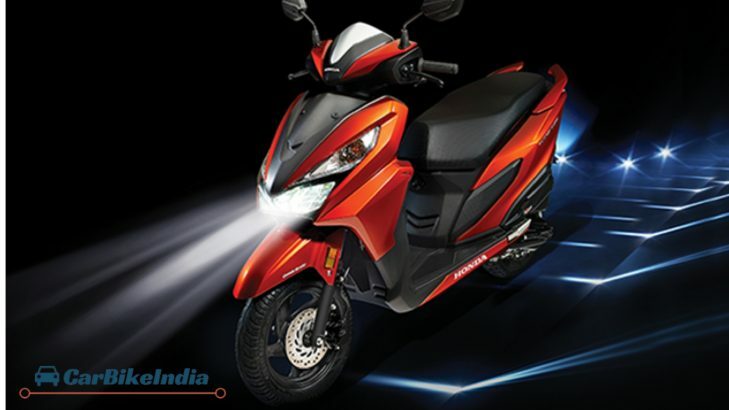 Honda Motorcycle and Scooter India (HMSI) has launched the all-new Honda Grazia in the Indian market. The Japanese automaker seems to be not self-satisfied with its products all these years. From funky looking Navi to female centric Activa and rural centric Cliq, the versatility continues to excite the Indian folks. However, what was missing so far was a feature-rich scooter boasting sporty aspirations, both mechanically and visually which the new Grazia aims to fit into. So, to impress the masses, Grazia has been loaded with a lot of styles, modern features and premiumness. Pre-booking for the scooter began in the month of October and since then, the company has received around 1,000 bookings with the dealerships getting about 8000 queries that clearly shows the popularity of the product before the launch itself. Honda Grazia is specially designed for the ultimate riding experience which is full of functionality and style. So will the Japanese automaker be able to cut the mustard this time also? Let’s find out in this review. Honda Grazia gets the contemporary urban design which looks very edgy as well stylish. Grazia is the precise expression of what we call a modern scooter that lends a European styling. It is bestowed with futuristic v-shaped LED headlamps coupled with the LED position lamps that provide the rider with superb visibility and great aesthetics. Honda Grazia gets the fully digital meter along with Eco Speed indicator which seems as an innovative approach from the company’s side. Front glove box comes with mobile charging socket and the space for the storage. Another important feature in Honda Grazia includes Telescopic Front Suspensions which makes the ride on a bumpy road very smooth and comfortable. Honda Grazia for better convenience of the passengers comes with 4-in-1 ignition lock with smart seat opening switch placed at the front that saves the hassles of pulling out the key and unlock. The spacious under seat storage of 18-litre can easily carry regular face helmet or a small bag. At the rear, Grazia gets stylish split grab rail and the chiselled tail light that makes it more attractive. In terms of safety, the top trim of Grazia gets 190mm disc brake with CBS (Combi Brake System) that essentially applies both the brakes even if the rider pulls up the rear brake lever. The braking system equalizes and decreases the braking distance and makes sure that one always remains in control. The scooter also gets Auto-Headlamp On (AHO) function which keeps the headlamps ON as long as the ignition is on. This safety measure has been recently made mandatory by the Indian government and has been followed by many countries. On the dimension front, Honda Grazia measures 1812 mm in length, 697 mm in width, height of 1146 mm, while it gets the ground clearance and wheelbase of 155 mm and 1260 mm respectively. Seat height of the Grazia is 766 mm that provides better positioning. The scooter has a fuel tank capacity of 5.3 litres. Honda Grazia has been launched with a total of three different variants that includes Honda Grazia Std, Honda Grazia Alloy and the top end Honda Grazia Deluxe. The basic styling remain the same among all the three trims but the top variant gets all the bells and whistles such as – black alloy wheels, USB charger in front glove box, LED headlamps and many more. The all-new Honda Grazia gets the same engine which is at present powering the Activa 125. The engine operating the Scooter is a 124.9cc air cooled SI that can produce the power output of 8.52 bhp at 6500 rpm and generates the peak torque 10.54 Nm at 5000 rpm. The engine comes mated to V-Matic automatic transmission, together, making a strong combination to reach the top speed of 85 kmph. Honda Grazia is a revolutionary vehicle that has been closely examined by the makers to provide more and more safety to the rider. For that, it gets alloy wheels with tubeless tyres which in turn reduce the chances of instant deflection if one tyre gets punctured. The front end receives the telescopic fork that leads to 12 inch wheel while braking duties are performed by 190 mm disc brakes in the top end variant, providing extra stopping power. Its 12 inch front wheel is shod in 90/90 rubber and the 10 inch rear gets 90/100 tyre. Honda Grazia has been priced very low keeping in mind the increasingly competitive environment. The standard model gets the price tag of INR 57,897, Grazia Alloy is priced at INR 59,827 while the top end Grazia DLX, has been tagged at INR 62,269. Honda Grazia Scooter gets 6 different colour pallets viz. Pearl Nightstar Black, Neo Orange Metallic, Pearl Spartan Red, Pearl Amazing White, Matte Axis Grey Metallic and Matte Marvel Blue Metallic. Honda Grazia in the 125cc scooter segment will be competing against Vespa VX 125 and Suzuki Access 125. Though, it will face a challenger within the Honda product range i.e. Activa 125, but the new Grazia with first in class features such as digital instrument panel, LED headlamps and outstanding comfort bits like seat opening switch and glove box, will certainly create its own niche in the segment. Honda Grazia Scooter is stated as an ‘Advanced Urban Scooter’ by the company and as the name suggests, it is designed mainly to entice the young guns from the urban background. With the launch of Grazia, the total number of Honda product range now stands at 7 that make the grip over the market, a little more strong. Currently, Honda Activa is dominating the Indian market so it will be very interesting to see if Grazia overtakes the older Activa or not. 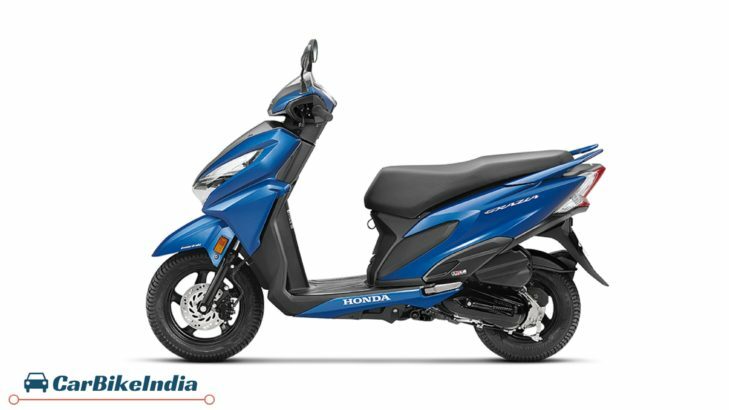 Honda Grazia is launched with INR 1000 more than 125cc Activa in terms of pricing. As compared to its competitors, Honda Grazia is more reasonable than Vespa and slightly more costly than Access 125. It seems Honda’s attempt to create a world class package has been achieved with the launch of Grazia as it looks cool, has contemporary styling, well equipped and is able to accommodate every reasonable riding style. So we believe there aren’t any reasons left to say this product is short of perfection. ← 2017 Ford EcoSport Facelift Review – Price List, Mileage, Engine, Features, Safety, Exterior, Interior And More! As Honda always provide the best quality to its customers.That’s why the users of Honda always trust it. The Honda Grazia design is so cool and gives an attractive look. The petrol consumption of this bike is very good and it is best for the local areas. Thanks for updating us on Honda projects.